Yazmina De Casta is 42 years old and married with two beautiful daughters. Originally from Panama City, Panama, Yazimina currently resides in Arlington, Texas where she has been modeling for about 4 years under the name “Yazmina La Flor”. Yazmina has a true passion for fashion, citing how it has no color, size, weight, age, or ethnicity requirements “It’s universal”. Yazmina began modeling as a way to learn to love herself. Yazmina believes that low self-esteem is a real issue for many people and a battle she had been fighting for years. Through modeling, she has pressed forward to overcome that obstacle. Yazmina considers herself as a true giver, one that is there to support others and share her gifts. Yazmina sees it as a blessing to be able to help others. She also serves as a Pastor Assistant in addition to donating her time and talents supporting non-profit organizations. Yazmina’s biggest inspiration has come from working with people who she states “believed they weren’t good enough to achieve their dreams because of some insecurity”, but through hard work and determination were able to overcome those obstacles. 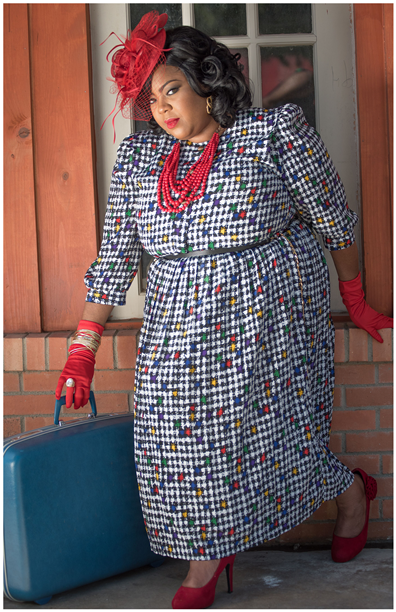 uplifts and motivates others as she graces the runway. She has a keen sense of fashion and takes command as she models designer pieces in editorial photoshoots. Yazmina is a brand ambassador for the Designer Faith Diva and Laila Glam Cosmetics. She’s been published in three magazines and has appeared in a video and commercial for a fashion boutique. Yazmina had the good fortune to model for a designer on Good Morning Texas News Cast. day” where those proceeds directly support several charity organizations. She doesn’t stop there, she also delivers meals in the Meals on Wheels program and volunteers at the local elementary school where the annual event supports low income families and children. enjoys creating styles from her Thrift Store finds which often surprises people by how stylishly her outfit treasures come together. Yazmina reminds women to create and wear clothing that is flattering to your size and shape. Don’t settle for something just because you find it in your size, allow it to compliment you. Yazmina believes it is important that women find their own style, one that makes you feel and look confident, bold, and makes a statement everywhere you go. It is very important to embrace who you are and feel empowered in your clothing while motivating others. She believes fashion is an artistic way to express yourself in the clothing that you wear. Yazmina’s vision is to be a worldwide trendsetter, cover model, Fashion Icon and even a legend! With hard work, determination, and positivity, through God all things are possible. Be Free To Be You!! !